A home is nothing if not a place of love, and love is clear in Oksana's home in Chattanooga, Tennessee. The family home, which Oksana shares with her husband and their baby girl, is full of European charm in the middle of the South. Oksana fell in love with interior design in July of 2015, when she and her husband bought a 1930 bungalow that was previously abandoned for 20 years. 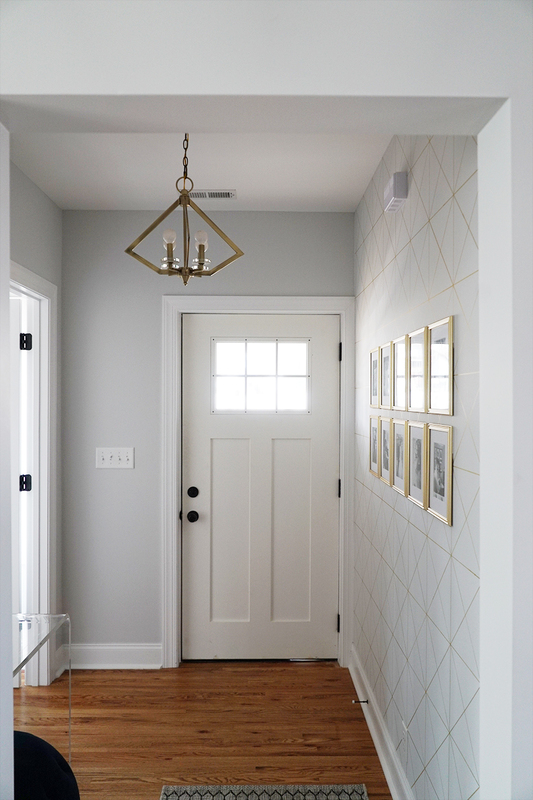 Since then, the couple has worked to bring the house back to life, tackling DIY projects like nobody's business and documenting the fun renovation adventures on their blog, Foxy Oxie. I wouldn’t say I have a particular style, but I am drawn to an aesthetic of clean lines and geometric elements juxtaposed against more traditional silhouettes. The key, for me, is balance. I want our home to feel sophisticated but also real and honest and truly reflective of our everyday life, especially now that we have a young daughter and another little one on the way. I find that playing up opposing styles – feminine and masculine, soft and edgy, modern and traditional – is a great way to showcase personality in design. I am a compulsive redecorator by nature, and my style is ever-evolving. But I always, always gravitate towards a neutral color palette with lots of texture. Every now and then I’ll add in a pop of color – the latest being a moody teal – but it never lasts. Instead of knick-knacks, Oksana gravitates toward more permanent fixtures. Every room is full of love, yet simple; graphic and bold, but timeless. Perhaps it's the combination of Oksana's career as a graphic designer and her family life as a wife and mother that brings balance to bear. Regardless of the reason, it sure has created a beautiful home! Oksana, thank you for the tour today! Follow Oksana and her family along on Instagram at @foxyoxie. That's how a visitor once described Amber's family home in Albuquerque, New Mexico. Surrounded by a bunch of boys, Amber has created a space that blends everyone's interests and loves. Through some trial and error, Amber has landed on a style that makes sense for her and her family. An important component of that style are family heirlooms, some of which Amber has refinished and some of which she's left in the original state. A home full of stories, some old and some new, is a beautiful thing. Amber, thank you for showing us around! Follow Amber along on Instagram at @the_beautiful_savages.